Arian Foster formally talked to media today for the first time since last season ended, but he didn't give them anything useful. The Texans running back basically repeated the same answer, about trying to be the best teammate he can be, for a minute and a half before peacing out. 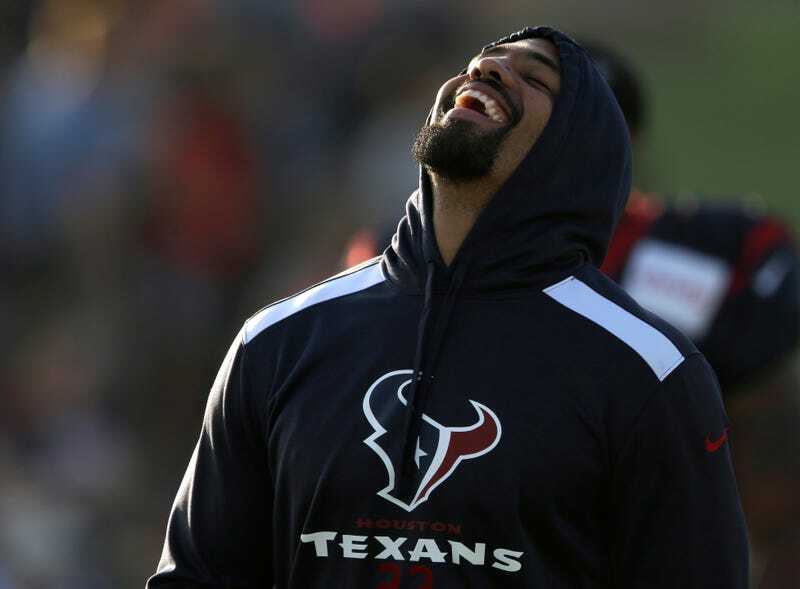 Though some Texans beat writers on deadline probably weren't amused, the stunt's funny to the rest of us. Foster: I'm just out here trying to be the best teammate I can be and I'm gonna work hard at doing that. Q: Physically, you're good to go? F: I'm just trying to be the best teammate I can be, man. F: Yeah, man. I'm just trying to be the best teammate I can be, you know. I'm gonna work hard at doing that. F: Yeah, I'm just out here, working hard every single day, trying to be the best teammate I can be. F: You know, being with your teammates and being the best teammate you can be is what you strive to do. So that's what I'm out here for. F: Yeah, man. I'm just (trying) to be the best teammate you can be, man. Just work hard at doing that every single day. That's what we're out here trying to do. F: Yeah, man. I'm just out here trying to be the best teammate I can be. And I'm gonna work hard at doing that. Q: How's that coming, Arian, your progress with being a better teammate? F: Yeah, you know, I'm just, every single day, just trying to be a better teammate, man. F: Yeah, man. I'm just out here trying to be the best teammate I can be. And I'm going to continue doing that. F: Yeah, man. I'm just out here trying to be the best teammate I can be. And I'm just going to continue to do that. Q: What was the offseason like, working at your brother's facility, different than other previous seasons? Take a page from Arian and ask yourself: Are you trying to be the best teammate you can be today?